Before I get into brass tacks here, let me just say that last night’s Kyle Kinane show was one of the best experiences of my comedy-life. I was proud to be among the cadre of Knox-locals (namely Trae Crowder, Jeff Blank, Jay Kendrick, Matt Chadourne, and Angela Garrone) who provided the support, and I cannot thank enough the staff of the Pilot Light as well as the crowds of people who came and sold out both shows. Kinane, gracious as always, did two headlining sets, and mayyyybe repeated about 25 minutes of material between the two. That gives him a solid two hours of material he did, and it was all fantastic. This was easily the most unforgettable comedy show I’ve been part of or seen since moving here. THIS WEDNESDAY NIGHT AT THE PILOT LIGHT. We’re gonna be trying something a little bit different. My buddy Mike Finazzo unfortunately needed to cancel his trip down, so Jeff “@RogueGinger” Blank and I got to talkin’. For as long as I’ve known him, Jeff has always wanted to kickstart a panel-type show. Thing was, my good friend (and erstwhile Ragnarok3.0 tourmate) Evan Valentine was already planning to come up for that night (as well as local feature and dapper gent Collin Gerberding) and I wanted to make sure they had a chance to do standup at the Pilot Light to an appreciative crowd. After a small mess of not thinking things through, we decided to give the live talk show a whirl. This has been something I’ve wanted to do for a good while, and it gets to integrate all the finest elements of pure comedic good times and bullshitting. Plus, I have no idea if Knoxville has had something like this before (at least not in the way we’re planning it). We chose the name Friendly Town after a term given to the once-thriving Red Light district down the street from Old City that the white devils plowed under during urban redevelopment. It has an eerily good ring to it. What else? We’ll be taking panel questions from lucky audience members! Did I mention Evan is a celebrated writer for Collider? This is not something that Knoxville’s comic book lovers will want to miss AT ALL! Also, I’m going to dressed all purty. And we’ll have a rare set from Katie & the Bass Drums, a side project of wizard rappers Lil Iffy! With your alls’ help, this can become a fantastic local institution, heavily dedicated to promoting the art and work of anyone who’d like to participate. Show starts at 9pm, 18+ and donations will be happily accepted to finance the schleps our guests are making to be there. Oh, and on August 18th, QED Comedy Lab is debuting at the Pilot Light. If it were possible, I would say that’s too many great shows coming up. 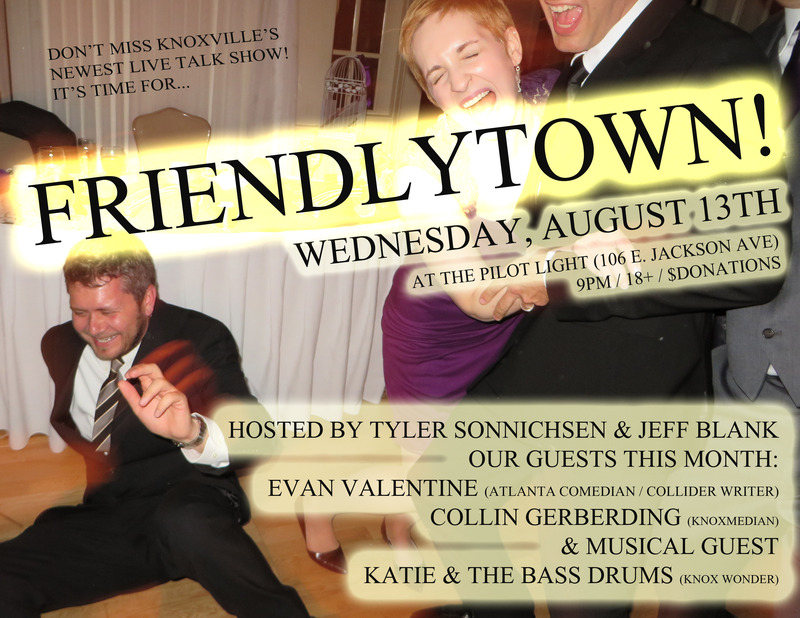 Tags: collider, comedy, katie and the bass drums, knoxville, live talk show, old city, pilot light, QED Comedy Lab, stand-up, talk show. Bookmark the permalink. Previous post ← Ragnarok 3.0 Tour Split Cassette available!